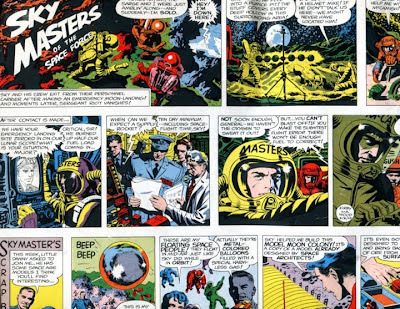 Kleefeld on Comics: Sky Masters... In Color! 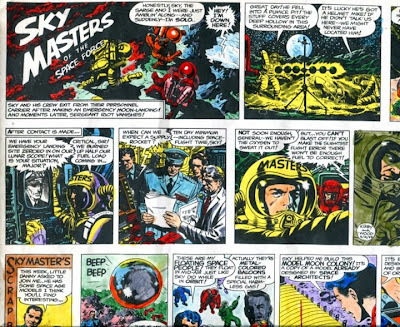 Sky Masters of the Space Force has got to be the most under-appreciated work in Jack Kirby's career. 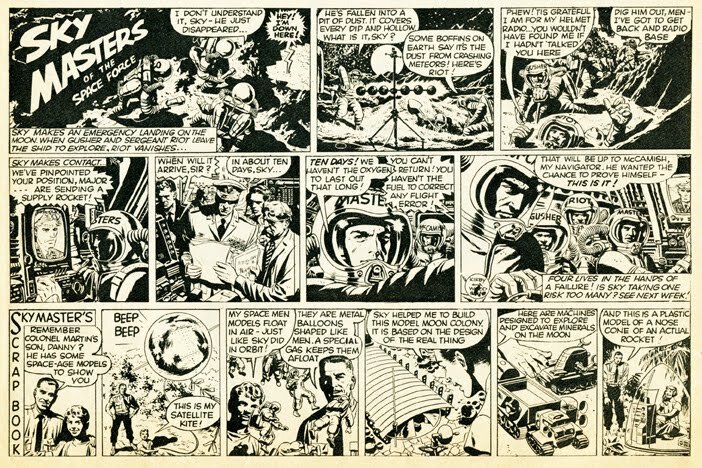 It's got absolutely brilliant illustration and storytelling, particularly for a newspaper strip; the Wally Wood inks from the earlier part of the run are gorgeous; it's also probably one Kirby's most-ground-in-actual-science works, but still has a grand sense of adventure and exploration. It's a real shame that legal difficulties kept the strip from running longer. Greg Theakston has probably done the most work keeping any interest in the strip alive and well, having retouched and republished the series multiple times. I think he came out with a two-volume version last year. But he also recently posted some scans on Facebook that I'd like to examine here. It looks fantastic, I think (even though the Theakston-printed versions are MUCH cleaner) but it's not how it originally ran. It was originally a Sunday strip and thus in color. But, color printing being a little pricier and the daily strips being in black and white anyway, this is how it's generally been seen/reprinted. You can see they've basically stayed true to Kirby's original, but cleaned up some of the bleeding edges and unified the slight variations from Kirby's watercolors into solid blocks. The only really significant change is in the caption box of the first panel in the third tier; I have no idea why they opted for muted purple-ish color instead of the orange that Kirby specified. You can easily see how muted the overall palette looks on the newsprint, instead of the pristine white board. That's one of the reason why such garish colors were chosen -- subtlety simply did not translate onto newsprint. You can particularly see it in that Earth in the second panel; it loses nuance with each step so that it's just a blue squiggle by the time most readers would have seen it. It's also noteworthy that there are some differences in the panel arrangements. Kirby designed the strip so what was originally the bottom tier could be discarded if an individual paper wanted to use that space for something else. Another strip, perhaps. 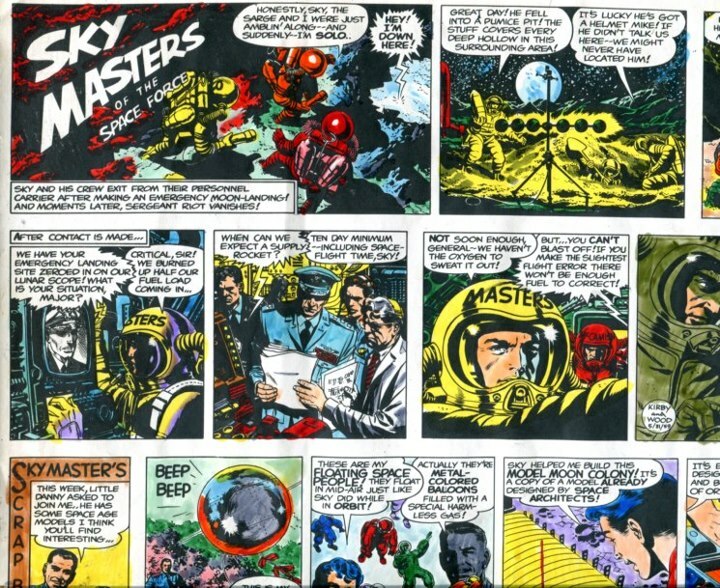 So the Sunday Sky Masters was essentially two separate strips. In addition, Kirby has an extra beat panel (seen as the first panel of the third tier in the final published version I have here) that could be added or dropped depending on how the newspaper wanted to run the piece. You'll note that the printed version here still retains three tiers, despite dropping the "Scrap Book" section -- they've completely reconfigured the strip layout to fit a slightly narrower format. But doing so opened up a little extra space, hence Kirby added the extra beat panel, which is unnecessary for the overall story, but helps with the new layout. That's one of the things that really impresses the hell out of me with Sky Masters. 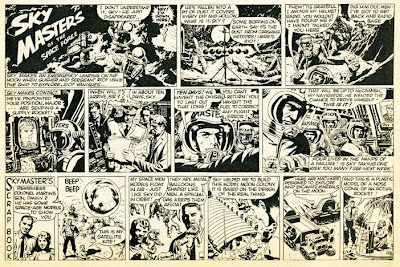 Kirby has this strip set up so brilliantly that a newspaper could run it in several different ways to fit its preferred format, without losing anything in the overall story. Not to mention (though you can't really see it here in one strip) that he's able to move the action along from day to day with recaps that sound so little like recaps that you won't get bored reading them all in a collected edition back to back like a graphic novel. You know, I'm going to give my editor at Jack Kirby Collector a buzz right now, and see if he can't run some of the Sky Masters strips in the new color section that he's doing for the mag. There's some brilliant stuff there that I don't think many people have seen. I have one issue of Express Weekly with Sky Masters in it. 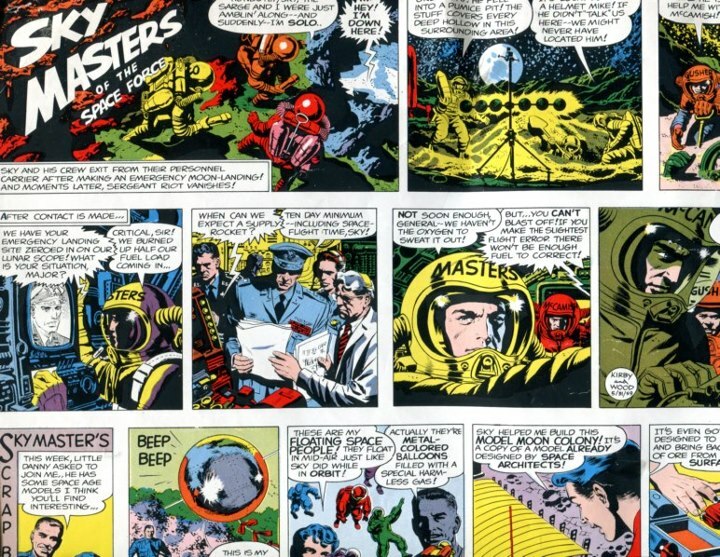 Unlike your example, it consists of a week's worth of dailies sympathetically edited into a two page spread, across the top half of the tabloid-size centrespread; it was also coloured in in the full, beautiful colour which was such an important part of up market British comics in the 1950s. Sadly, my dinky little A4 scanner is no use for scanning such large images, so I can't share. 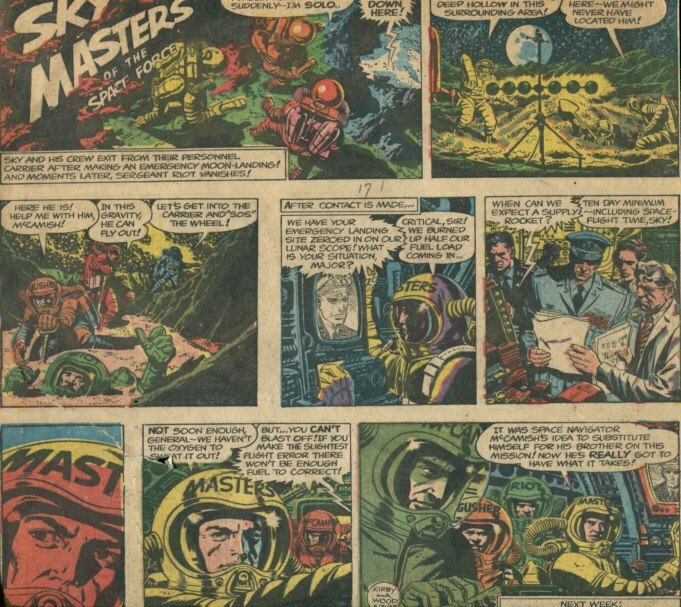 Sky Masters ran in Express Weekly in issues 208 to 259 running slightly after original publication. Note how the Express Weekly sample has heavy changes on the copy. A Rights Issue Leading To Collectability? "Hi. My Name Is Jack Kirby."